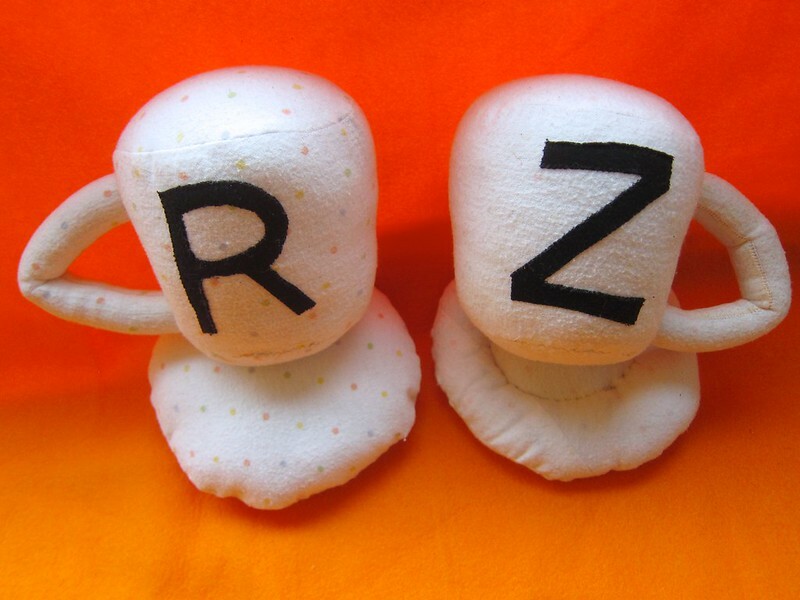 Somehow Ms. Z got it in her head last month that the absolute BEST Christmas present she could possibly make for her one-year-old cousin Ms. R was... a smiling stuffed coffee mug doll. With a matching one for her, so they could sit around and have coffee parties and pretend to drink coffee together. Fabric: The body fabric is just a soft, fuzzy, and well-worn old cotton polka-dot cotton flannel receiving blanket, of which I have more than I could ever possibly use. Z requested we use the white side for her mug, and the polka-dot side for Ms. R's mug. I had JUST enough to make the two dolls, but had to piece the bottom of Z's saucer to make it work. The appliqués are cut from an old black T-shirt. Notions: Fusible webbing (Lite Steam-a-Seam 2, no longer hard to find, hurrah!) and Polyfill stuffing. But the coolest thing about this project (which was actually finished quite a while ago, just not photographed properly until now), was that Z sewed a large portion of it at the machine, by herself... with my close cautious supervision. 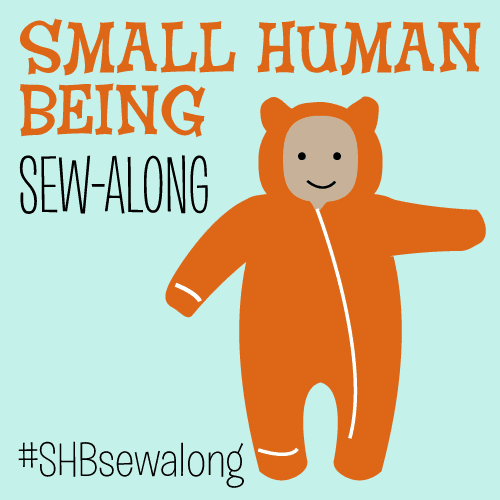 (As detailed in my recent post "How old were you when you first used a sewing machine? (with poll)". Little Ms. R is coming to visit soon, so we'll soon see how she likes it in person! Really cute. Gah, now I'll have to teach my little guy to sew. He's the same age as yours and fascinated by the sewing machine. Oh, do it! 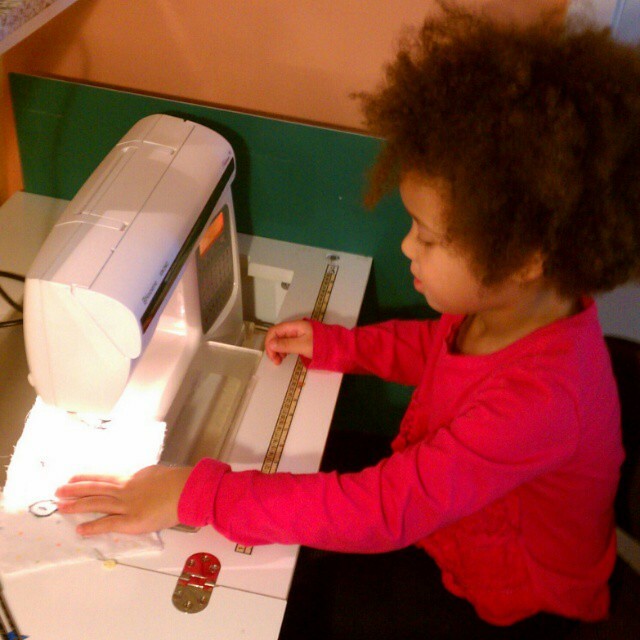 I found it was easier to start in stages... first I started letting her cut out pattern pieces, then she moved on to a little hand-sewing and practiced sewing buttons and such to fabric... then I let her operate the foot pedal while I sewed... she loves it! Stooooooopppppp! I seriously can't handle the cute!!! These are adorable! Love that she wanted to make one for her cousin...but also herself. I would too, though, if they turned out like that. 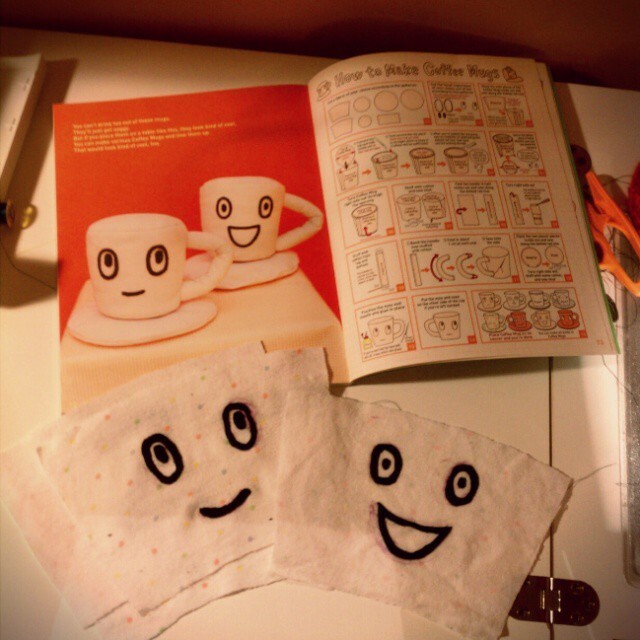 Last time I tried to make a coffee cup plushie it came out looking more like a disgruntled beer stein. Go figure. I'm going to need to check out that book now. It really is a great book, and they also have two others, I think — Cute Dolls and Baby Stuff. 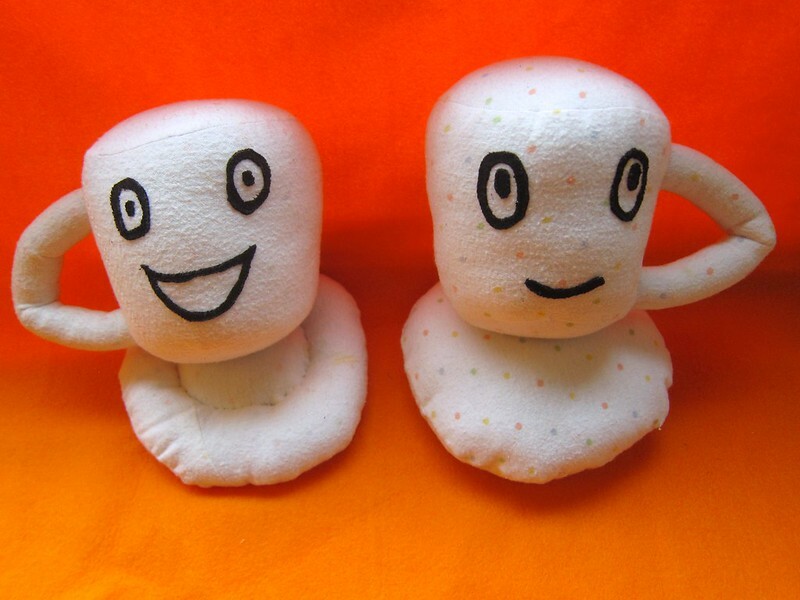 She also offered to make a coffee cup doll for her dad as well (he's actually the only one who drinks coffee around here, I'm a tea person) but never made good on it. 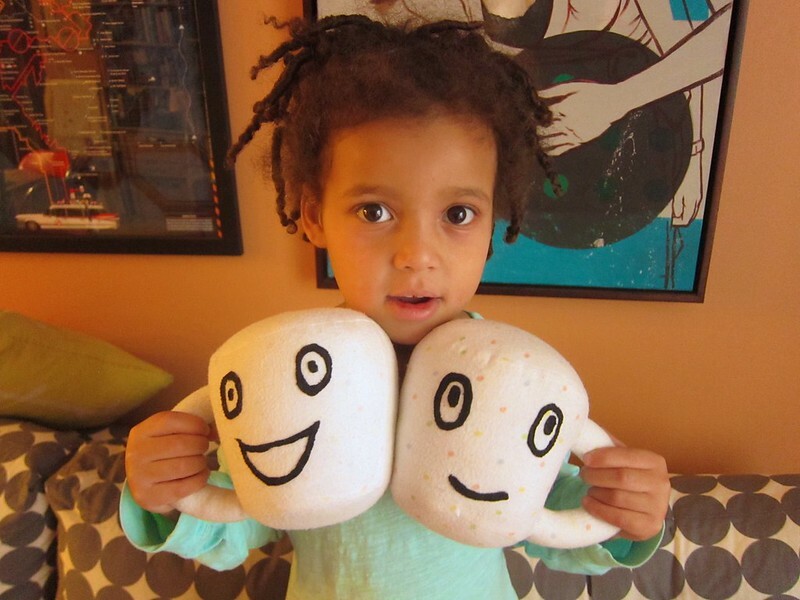 Oh my gosh, I am cracking up that she chose ... stuffed coffee cups! So that they could pretend to drink coffee together!? OMG. That is hilarious and adorable! As are the cups themselves. And Z. My goodness, she's precocious! Can she reach the pedal? Or do you use the start/stop button? I must go back and read your post. Joe wants to use the machine, but I haven't really started that yet (he's older than Z, too). We put the pedal up on a stool for her, it worked great. You have a talented (and adorable) little girl!